Your ancestor's exact place of birth is critical. You won't get far without it. one that goes back 3 generations? Answer: Knowing where to look for more records. We all began our family tree by entering what we know. Ourselves, our parents, our grandparents. Maybe some of our great grandparents. But you can't go back farther than that until you learn where your ancestors were born. Not in which country. Not in which state, province, or region. Which town. When you know the town, you can find birth records and parents' names. You can finally climb that branch of your tree. You'll know exactly where to search. So how do you discover the name of the town? 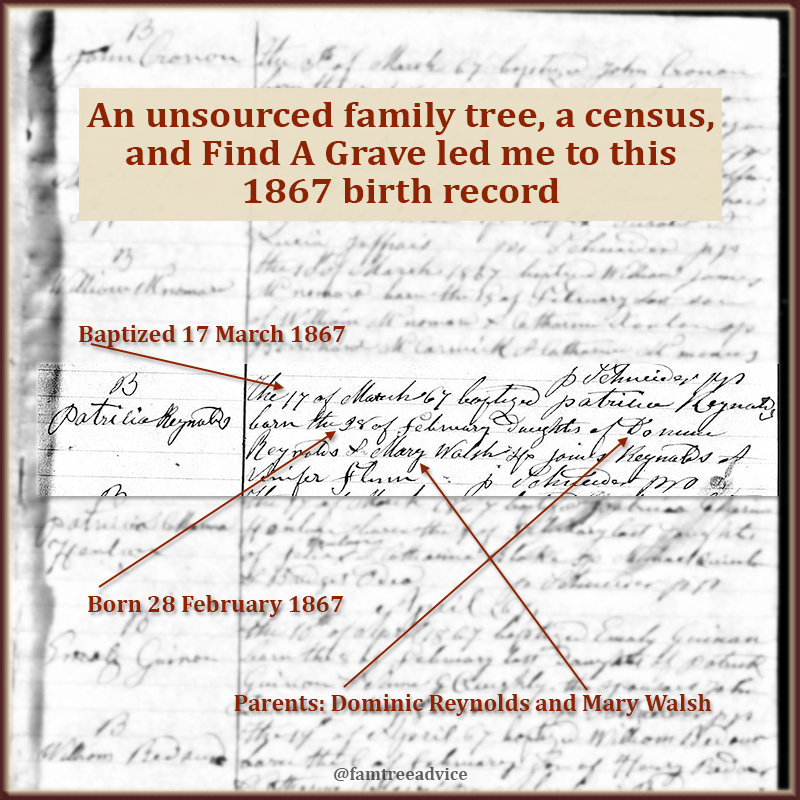 Let's look at 6 types of genealogy documents that can show you the town of birth. Note: Sometimes the first document won't give you the answer. But it can give you clues to help you find the next document. 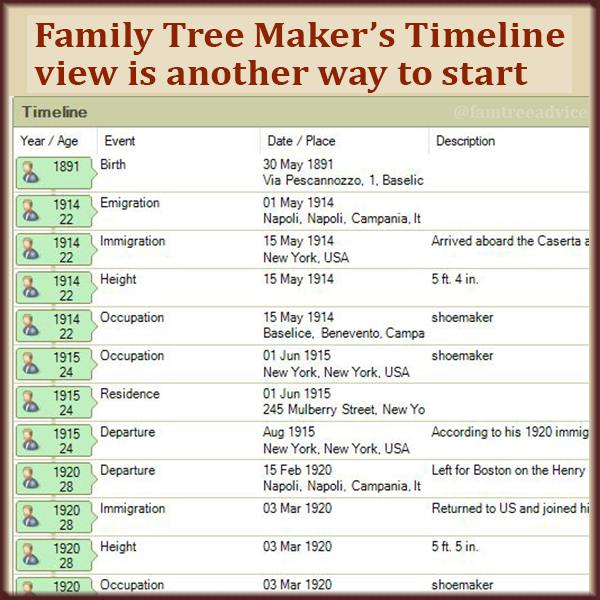 Searches: A distant relative published a detailed, but unsourced family tree. I borrowed names, dates and photos, but I had to find good sources for myself. U.S. Census forms confirm that Patricia was born in Canada, and her parents were born in Ireland. I found Patricia's 1867 church baptism record on Ancestry.com. The hand-written record is from a church in Goderich, Huron County, Ontario, Canada. Goderich is less than 10 miles from Clinton where the relative said Patricia was born. Conclusion: Patricia was born on 28 Feb 1867 in or near Goderich, Canada, to Dominic Reynolds and Mary Walsh. Gathering facts from multiple documents can lead you to that hometown. Conclusion: Francesco Saverio was not born in the same town as his wife or children. He was born in the neighboring town of Circello, giving me new roots to explore. Searches: This branch of my family was a dead end. My grandmother told me the family was from Avellino, Italy. But did she mean the town or the province? That's like the difference between New York City and New York State. Conclusion: Mario Maleri was born on 7 Feb 1893 in Pesaro, Pesaro e Urbino, Marche, Italy. 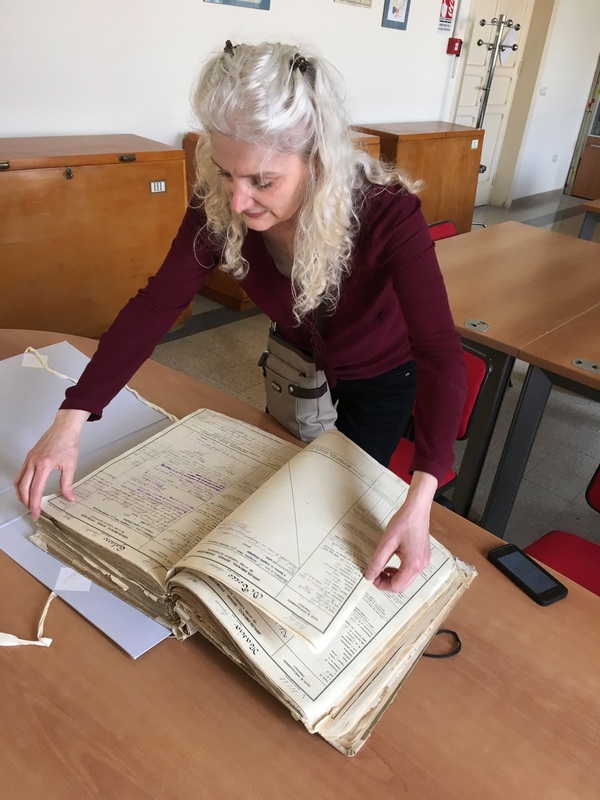 Pesaro is a big city with records available online. His wife was born in the same town a year later. If I go through the records and find their birth records, I can take the family back another generation. Or more. 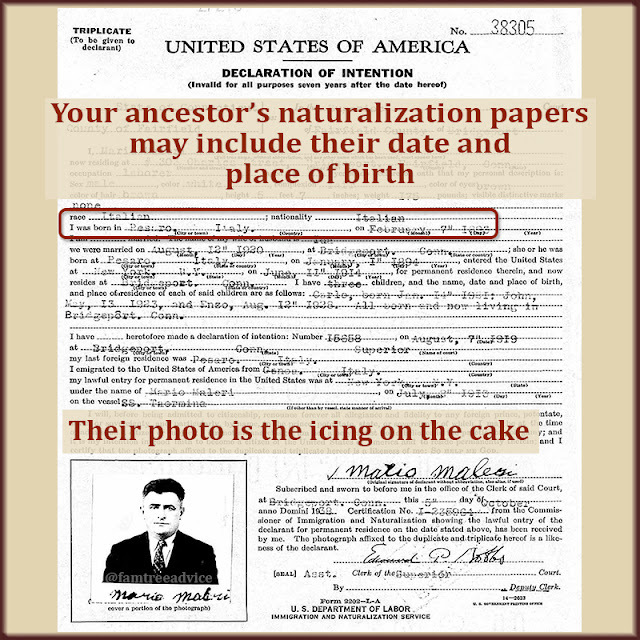 Finding the right document can unlock your ancestor's past. 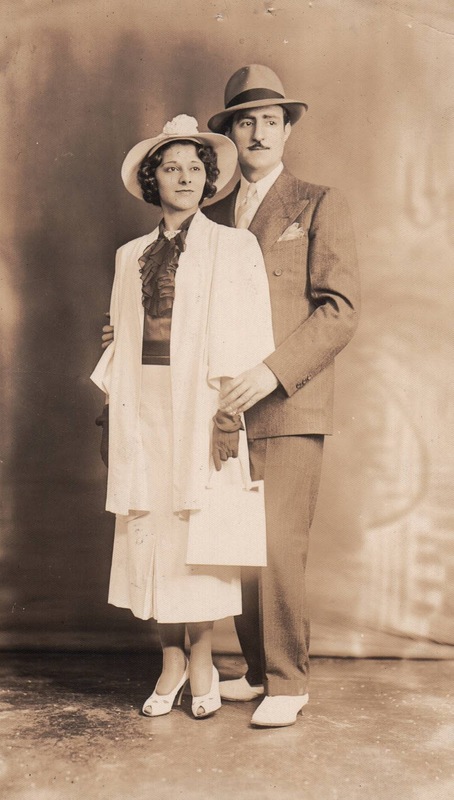 Searches: In 1922, Elizabeth Merrin and her husband Walter Smith took a trip home to England. I found their passport application on Ancestry.com. While it didn't include their towns of birth, it did give me their exact birth dates. With those dates, I found their 1896 marriage record in the town of Derby, Derbyshire, England. The 1871 England Census shows baby Elizabeth Merrin living with her parents and sisters in Derby. Searches: My father didn't know where his grandmother was born. But his cousin told me Maria Rosa said she was from what sounded like Pisqualamazza. I searched for ship manifests with anyone named Caruso, hoping to find a town called Pisqualamazza. Conclusion: What I found, again and again, was the town of Pescolamazza, now called Pesco Sannita. That's where I found my great grandmother's birth record—and her unknown twin brother. Now I've taken her family tree back 5 generations. Do you have dead end branches on your family tree? Find every possible document for each dead-end ancestor. The combination of facts can lead you back home, where your family comes from. You've got the raw materials. Now let's shape them into a remembrance of your ancestor. Have you ever thought of writing about your family history? Do you have an ancestor who's interesting enough to write a whole book about, but you don't know where to start? It's very possible you haven't started because the whole project seems too big. Let's end that problem here and now. Stop thinking of your ancestor's story as a book. Don't even think about it as a short story. Break things down to 5 simple steps and watch the project take on a life of its own. 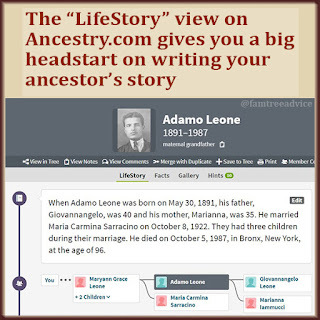 To show you this simple process, I'll use my grandfather Adamo Leone as an example. Since he was a World War I veteran, this is good timing. I've gathered almost every major document possible for my grandfather. Only his naturalization papers are missing. I'll start this process by looking at this facts chronologically. 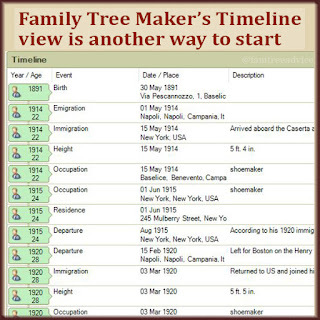 In my Family Tree Maker software I can view a timeline of every recorded fact. On Ancestry.com I can view his "LifeStory". No matter how you view your collected facts, this is where you'll begin. Use whatever word processing software you prefer. Put your ancestor's name at the top and start a bulleted list using the simple format of Date: Event. timeline view. Does your software? Copy the main facts, in order, into your outline. Try to use complete sentences, but don't worry about making things perfect. If you're inspired to add a sentence or two to describe something about a fact, go right ahead. My grandfather fought in World War I and was a prisoner of war in Austria for a year. I've gathered facts about the battle where he and 300,000 other Italian soldiers were captured. Earlier this year I went to Italy and photographed his Italian military record. That document is packed with dates I can add to his timeline. I'll add the name and date of his battle. I'll add the dates of his imprisonment. I'll add the time he spent recuperating before returning to New York. I'll add some facts I've gathered about the places he worked or owned a shoe store. In short, I'll try to paint a picture of what was going on in my grandfather's life and in the world. You don't want to make your file too big to share. So don't add every document you've collected to this file. There's probably no one who cares as much about every single census record as you do. Be conservative as you add images to your ancestor's life story. Place some photos and document images where they belong in the timeline. 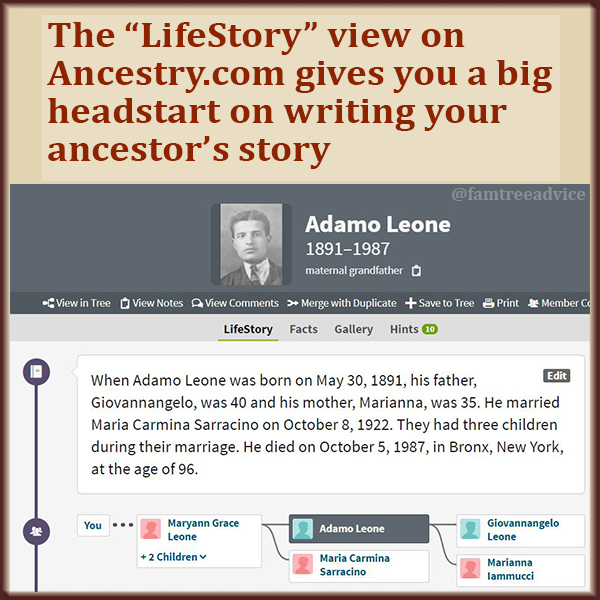 When you break it down, writing your ancestor's story can be pretty easy. Now that you've got so many facts listed in chronological order, it won't be hard to make them more fun to read. Go through all the facts one by one. Add words to make more complete sentences. Add details that you know from memory or from family stories. For instance, when my grandfather had his own shoe repair store, he once made shoes for the famous actress Gloria Swanson. She was only 5’1” tall and had tiny feet. She wore a size 4 shoe. Sometimes he would make sample shoes for her. If there were any that she didn’t want, Adamo brought them home to his wife, Mary. No matter how tiny the sample shoes were, she would cram her feet in there and wear them proudly. Eventually he stopped bringing them home, maybe because he saw how much pain they caused his wife. Step outside of your list of dates. 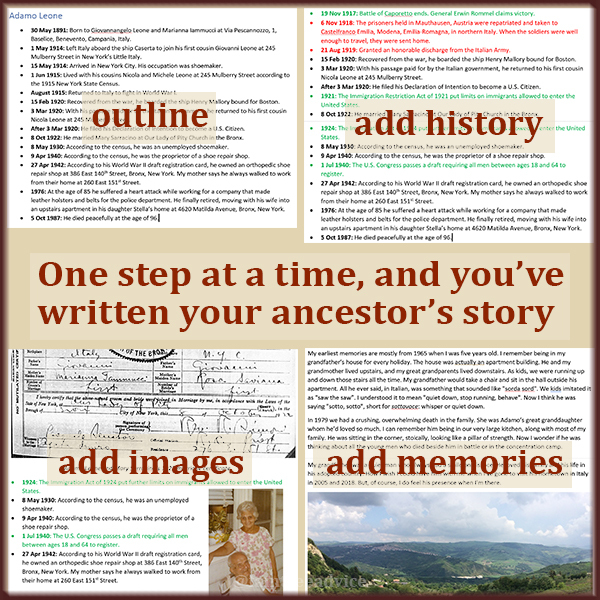 After all the facts, start writing some of your personal memories about your ancestor. If you're too young to remember them, ask your parents or older relatives for their memories. 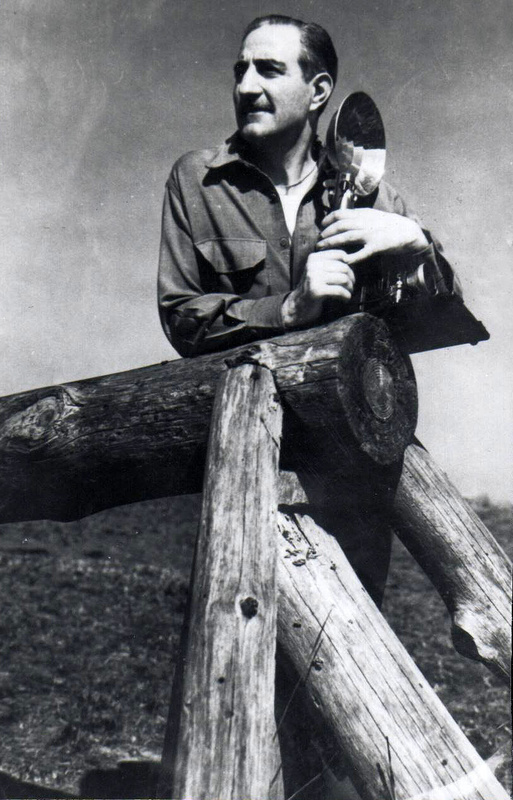 When I think about my grandfather, I mostly think about when I was a little girl—even though I was 28 when he died. I remember being in my grandfather’s house for every holiday. The house was actually an apartment building. He and my grandmother lived upstairs, and my great grandparents lived downstairs. As kids, we were running up and down those stairs all the time. My grandfather would take a chair and sit in the hall outside his apartment. All he ever said, in Italian, was something that sounded like "sorda sord". I understood it to mean "quiet down, stop running, behave". Now I think he was saying "sotto, sotto", short for sottovoce: whisper or quiet down. Put each story in a separate paragraph. Once you're done, arrange those paragraphs in chronological order as best you can. Now all you need is an ending. It may be a quote from the person or a quick summary of their life. My grandfather was a quiet man who always had a smile on his face. He loved his family and his life in his adopted country. How I wish I could have him with me when I've gone to visit his hometown in Italy. But, of course, I do feel his presence when I'm there. publishing the contents on your blog or your Facebook page. Several years ago I went to a seminar about writing your ancestor's story. I was focusing on my great grandfather. But I never wrote his story. I didn't know how to dive in. and anyone else for whom I've collected enough facts. Does Independence Day Make You Think of Your Ancestors? headline is my grandfather's story. I've tried using historic newspaper websites for my family tree research. I never seem to get anywhere. My ancestors were not in the society pages. They weren't captains of industry. All I've ever found are some of my great grandfather's real estate transactions. Today I tried a different approach. I learned more about my ancestors' lives by examining one important historical event. I turned to the free, online resources of the Library of Congress. Their "Chronicling America" project gives you access to historic American newspapers from 1789 to 1963. To get started, choose a state and a range of years. You can also try adding some keywords to your search. Last month while visiting Italy I saw and photographed my grandfather's World War I military record. I know the name and dates of the major battle in which he was captured and imprisoned for a year. He had been in New York before the war. He'd joined a few of his first cousins in Manhattan and was working as a shoemaker. archives to see my grandfather's records. When his Italian Army regiment called him up for duty, he sailed back home. He was in the infantry in 1915. He was promoted to Corporal on January 1, 1917. 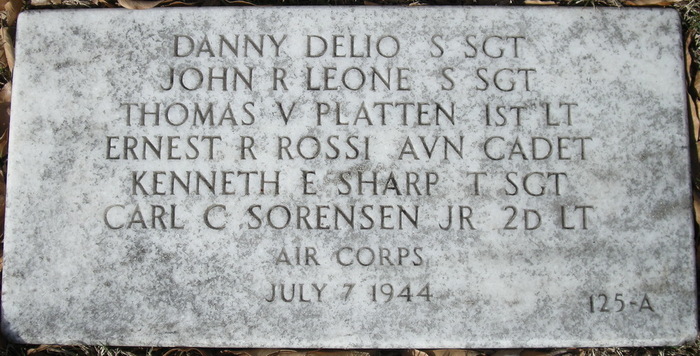 Then, like a few hundred thousand other Italian soldiers, my grandfather was captured in the Battle of Caporetto. The German Army imprisoned him in Mauthausen, Austria, for a full year. Using the Library of Congress, I searched the New York Tribune newspaper for the dates of the Battle of Caporetto. I watched the story unfold on the front page of the paper day after day. I read about the prisoners, the casualties and the devastating losses. Did my grandfather's first cousins—the ones who stayed in New York City—read this too? Did they wonder if their cousin Adamo was part of this epic battle? Did they wonder if he'd been killed or captured? Today we get our news so fast, it's hard to imagine waiting for the newspaper to tell you what's happening in the war overseas. Here's how you can put these free, digitized newspapers to work for you. Choose an event from history that was a huge news story during your ancestor's lifetime. Something they would have heard about nearly every day. Get started search American newspapers from the Library of Congress. Narrow your search to a single year. Click the checkbox to show only front pages. You'll see much more at a time, and the biggest stories will be on the front page. Search the images' captions for the most important date for this event. Then click that image. You can view the newspaper page by page, zoom in and out, and save any page as an image or a PDF. If your story is really big news, click to go to the next issue. By looking at several issues' front pages, I saw the story of my grandfather's World War I battle unfold day by day. This battle has great significance for my family history. What were the big stories that changed your ancestors' lives? Thursday night my husband and I landed in Newark Liberty Airport after a long flight from Rome. Our genealogy vacation was over. Our flight landed at 9:30 p.m., but customs took forever. We were in our own car by 11:30 p.m. with a 90-minute drive home ahead of us. A massive storm and tornadoes knocked out the electricity at home two days earlier. We arrived home at 1:00 a.m. and entered the house in pitch blackness. Our dog was barking and our son had woken up to let us in. After finding our toothbrushes in our suitcases, we all went to bed. I didn't have time to process my incredible journey through my ancestors' towns. This had been our fourth trip to Italy. We'd seen most of the tourist sites already. After two nights in Rome, we headed to Benevento, the province in Southern Italy where all my roots are found. On May 10, we rented a car and drove two and a half hours from Rome to the city of Benevento. If you're American, think of the city of Benevento as the county seat. We checked into the Hotel Antiche Terme and took the short walk to Pizzeria Romano—my cousin Vincenzo's restaurant. We could see Vincenzo inside, but there were workers trying to install a new sign and doorway, and I felt it was unsafe to go any closer. I couldn't get his attention. It was a bad feeling, thinking we might not get to visit Vincenzo. But we walked along Corso Giuseppe Garibaldi in Benevento so I could see the church of Santa Sofia. I thought the Archivio di Stato—the archives that digitized thousands of vital records from my ancestral hometowns—was near the church, but I couldn't find it. We tried the next block and the next block. Finally I asked two women where it was. They told me to go another block and look for an obelisk. I would find the archives there. Once I found it, I had to go inside. 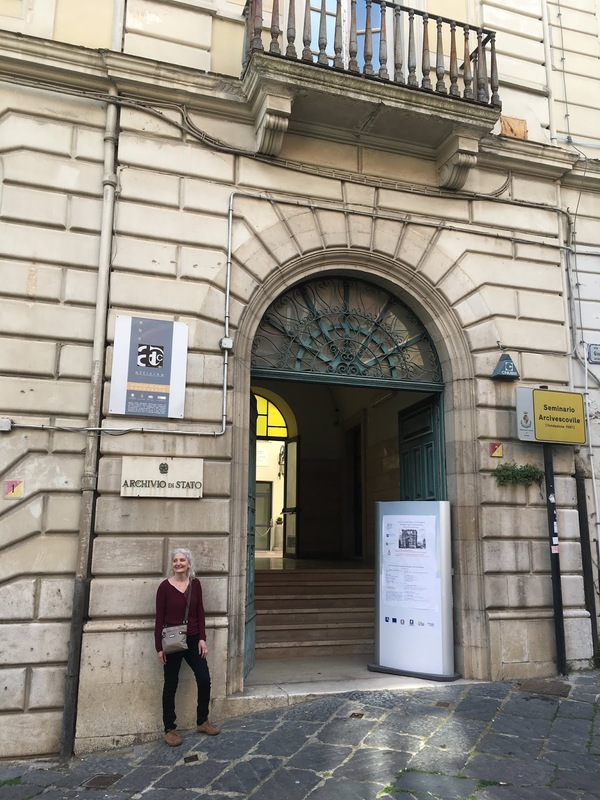 I had prepared a couple of Italians sentences to say in the hopes of seeing my grandfather's World War I military record. So that's what I began to say. Mio nonno era Adamo Leone di Baselice. Era un prigioniero di guerra con l'esercito italiano nella prima guerra mondiale. Before I'd finished, I was directed to go upstairs where someone would help me. Not sure where to go, I found two workers and began my statement again. The two workers conferred with one another and called in another woman. She gave me a form to fill out stating who I was and that I wanted this document for genealogical purposes. She gave me a second form giving me permission to photograph any documents. When I finished the forms, she had me turn around. A big volume was on the table, tied shut with white ribbons. This was register #67. That's the one I'd asked for, having looked up the document number for my grandfather on their website. My grandfather's Italian military record from World War I. If you have an Italian ancestor who served in the military, start at this page. Find your ancestor's last name (Cognome), enter his first name (Nome). If you know it, choose his birth place (Luogo di nascita), and choose the year he was born (Classe). Click search (Ricerca). If you get more than one result, hopefully you'll know the correct man by his birthdate. I clicked my grandfather's name in the search results. I found the two numbers I needed: Registro (register) 67, Matricola (roll list) 21728. So I needed to ask for register 67 and look in it for document 21728. I untied the white ribbons and opened register 67. I was surprised to be able to handle the pages. No white gloves, no one watching me all that closely. I turned the pages, approaching document number 21728. Instead, I found a big gap. The numbers jumped significantly. Not wanting to panic, I turned to a later section in the book and found document numbers closer to 21728. Finally, I found it. Leone Adamo. My grandfather. One year ago I wrote about my grandfather's World War I experience. He had told us only that he'd been a prisoner of war and had to eat rats to keep from starving. Research led me to the 1917 Battle of Caporetto in northern Italy. 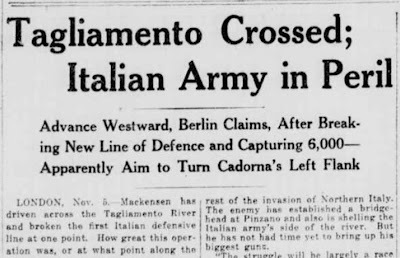 More than a quarter of a million Italian soldiers were captured. With such a large number, there's certainly a chance my grandfather was taken prisoner in that battle. The men were kept in camps in Austria, including Mauthausen. There were so many prisoners, the conditions were awful and they were not well cared for. Now I have an official record of my grandfather's military service. He served in the infantry from 1911 to 1914. At that time he was allowed to leave the military and follow his first cousins to New York City. My grandfather received a call to arms in May 1915. He left his new home in America in August, sailing back to Italy. He rejoined the infantry on 9 September 1915. He was promoted to Corporal on 1 January 1917. On 6 November 1917, my grandfather was taken prisoner, held in Matausen, Austria. It sure looks as if my theory, formed a year ago in my blog, was correct. He does seem to have been taken prisoner in the Battle of Caporetto which lasted from 24 October to 19 November 1917 on the Austro-Italian front. Matausen, or Mauthausen, was later turned into a World War II concentration camp. Exactly one year after his capture, my grandfather was repatriated at Castelfranco Emiliano in northern-central Italy. The army gave him some small payment for this lost year of his life. They sent him on on unlimited leave to recuperate in light of his loyalty and faithful service. After his recovery, on 15 February 1920, Corporal Leone left Italy once again for New York City. Shortly afterward, the army awarded him a commemorative medal of his service in the war. 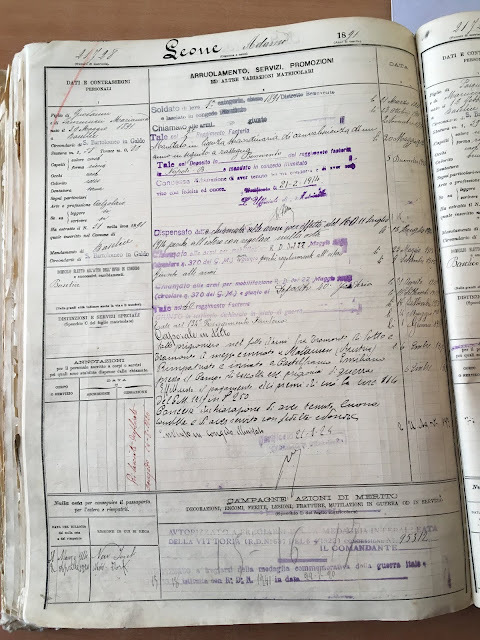 Looking at my grandfather's 1891 birth record. This one page from the archives is packed with information about my grandfather. At age 20, he was already a shoemaker. His hair was curly (like mine), his coloring was rosy, his teeth were healthy. His hair and eyes were brown. He was 5'2", which seems impossible because of how tall and proud he always held himself. He could read and write. I was in another world, standing there in the Archivio di Stato poring over that page. I didn't realize there was a new person in the room. A young man told me they had my grandfather's birth record and he would bring it to me. I had downloaded his 1891 birth record from the Antenati website, but of course I wanted to see the real thing! When he brought me the book, I was so surprised to see how large it is. It was at least 18 inches high and his record took up two-thirds of the page. I really think the group of workers was as happy as I was. It wasn't my plan to walk into the archives that day. I was saving it for the next morning. But I couldn't stop myself, and it couldn't have turned out better. One of my best family history clues came from a World War II draft registration card for a 64-year-old man. My grandmother's uncle barely made the deadline for the "old man's registration". In late April 1942, local draft boards recorded facts about men born between 28 April 1877 and 16 February 1897. The men were 45 to 64 years old. How badly did the war have to go before they called up 64-year-old men? Born four months into the date range, my great uncle was about to turn 65 when he went to the draft board in the Bronx, New York. His name was Semplicio Saviano, known as Sam. His World War II draft registration card tells me was was 5'6" and had an artificial left eye. My mother remembers being so afraid of him, and her mother would scold her for it. "He's my uncle. Don't be silly!" But maybe it was that fake eye that spooked her as a little girl. Sam's registration card also tells me that he was living in my mother's building. That confirms her story of seeing him at the end of the hall, staying in a little room that wasn't much bigger than a closet. He lists his sister (my great grandmother) as the person who will always know his address. That makes sense, too, because Sam's wife had died, and my great grandparents owned my mom's building. But the fantastic clue needed so badly was his place of birth. All I'd ever heard for so many years was that my great grandmother's family was from Avellino, Italy. The problem is Avellino is both a city and a province. So where did they come from? Although riddled with errors, this draft registration card holds a vital key to my family history. The answer, though completely misspelled, is printed neatly on the card. It says "Tofo - Province Avilino". I had no doubt that "Avilino" was meant to say "Avellino". So I checked an online map of Avellino for a town with a name anything like Tofo. Aha! 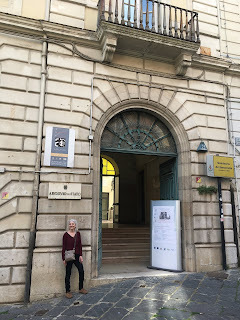 Finally, I had hard evidence pointing to the town of Tufo, Avellino. Shortly after this discovery, I was visiting the Family History Center in Doylestown, Pennsylvania. It was my first time at a Center, so I was just checking it out. One of the volunteers suggested I look at which films were sitting in their "Italy drawer". Would you believe I found a reel of film from Tufo? I made a big discovery thanks to that film. Sam was born there, and so was an older brother that no one in my family knew about. If you're searching for someone in the World War II draft registration cards, keep those birth dates (28 April 1877 and 16 February 1897) in mind. I'd been searching for my paternal grandfather's card for a long time before I realized he was too young. He was born in 1902—probably too old to serve, but too young for this registration. On 5 June 1917 they registered men born between 6 June 1886 and 5 June 1896. On 5 June 1918 they registered men born between 6 June 1896 and 5 June 1897. On 12 Sept 1918 they registered men born between 11 Sept 1872 and 12 Sept 1900. My paternal grandfather fell through the cracks again! He was too young to serve or be registered. 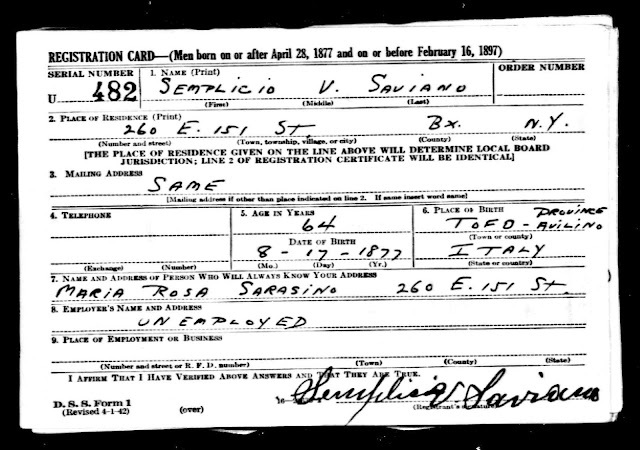 Draft registration card images are available on Ancestry.com and FamilySearch.org. If your ancestor didn't serve, you may have overlooked this important family history resource. Which of your male ancestors should be in these record collections? If this all seems a bit familiar, I did write about draft registration cards 9 months ago. Finding Sam's place of birth was such an important breakthrough for me, I want to encourage you to find your ancestors' cards, too. If you've been enjoying this genealogy hobby for a while, you may have more tools, skills, and knowledge at your fingertips than you realize. The other day my cousin asked me to track down his grandfather's uncle Pietro who died in World War I. Suddenly I realized how many online resources I have. I went straight to an Italian website that lists fallen World War I soldiers. Was this the fallen soldier I was looking for? My cousin's grandfather confirmed that the record I found was the right soldier. 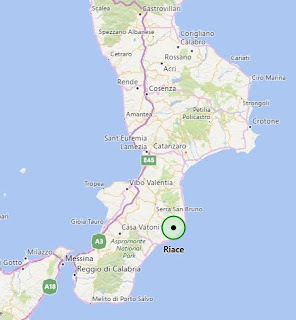 Now I had the all-important name of his hometown in Italy (Riace) and Pietro's father's first name (Cosimo). I jumped over to the Antenati website of vital records from Italian towns. Hurray! The town of Riace is there. I felt as if my years of research, my knowledge of Italian, and my long list of genealogy website bookmarks had a greater purpose now. They had the power to help others. It can be tough to research a family when you don't have first-hand knowledge of them. I'd tried before to build this family's tree, but I'd made a mistake and hit a dead-end. I needed my cousin's grandfather to tell me, "yes, that is my uncle". 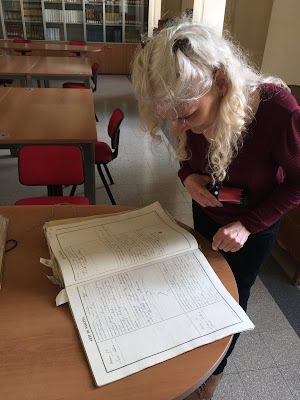 What do professional genealogists do? How do they go on if they don't have a relative available to confirm important facts? Here's what I could have done, and what you can do, too. I could have started with that brief record of the fallen soldier. At first, I assumed he was not our man because I thought Pietro's father's name was Ilario, not Cosimo. But it's a good idea to work with the record you have. See if you can prove or disprove any of it. Based on that record, I could have looked in the archives of the town of Riace for his birth. Ironically, the fallen-soldier record shows the wrong birthdate for him. But he is in the 1891 index of births. He was born on 9 January 1891. Using his birth record, I could have looked for evidence that lined up with what I knew about this family. And his birth record does have what I needed. Pietro's mother's maiden name was Niceforo. That's a fact I had all along. It was part of the scanty information I'd been told before. If Pietro's birth record showed a mother with any other last name, I would have no confidence that he was the right man. But there she was. Anna Maria Niceforo was this soldier's mother. With both parents' names confirmed, I could search for all of their babies and see if they had any of the names I knew. And they did! My new list of sibling names helped me find the ship manifest for my cousin's grandfather's mother, Teresa. I learned she'd been held in detention, kept briefly in the hospital because of "tremor of hands". 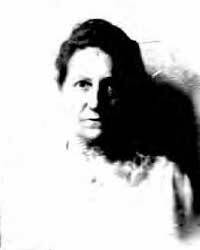 She'd left behind her father Cosimo in Riace, and was to be released to her brother Domenico in Brooklyn. That's the proof I needed. I had the birth record for her brother Domenico. Later I found Pietro's military record card on Ancestry.com. It said that Domenico in Brooklyn was the person informed of the soldier Pietro's death on 5 October 1918. His date of death also tells us which battle he died in. You might overlook a search result because it isn't a perfect match to your family member. I was ready to toss aside that soldier's record because I didn't recognize his town name or his father's name. But he was the right man. And Teresa's ship manifest was a bear to find. Ancestry's search only brought me to the page listing detainees. That didn't tell me her age, hometown, or her father's name. I had to comb through the 901-image collection to find the rest of her information. I had to have her main ship manifest entry to know that I had the right person. And it was worth the trouble. Now go out there and use your family research super powers for good! UPDATE: Publishing this story drew the attention of several of my relatives. We're now feeling a bit confident that my Uncle Army was in the Army Air Corps. His nickname had nothing to do with this. "Ame", which sounded like "aah may", is what my grandmother called him. It was short for Amelio (aah MAY lee oh). We kids thought it sounded like army. My "Uncle Army", the photographer. My earliest memory of my grandmother's brother—who we kids called Uncle Army—is posing for his camera. It was a large format camera that used glass plate negatives. It had a drape under which the photographer hid himself and his lens from the light. I sat on a long upholstered bench in my great grandmother's home with my two siblings and my three first cousins. He took our portrait. Uncle Army was a professional photographer in the Bronx. He took our communion photos, our confirmation photos, and our wedding photos. He was a portrait photographer par excellence. Everyone acknowledged him as a true artist. 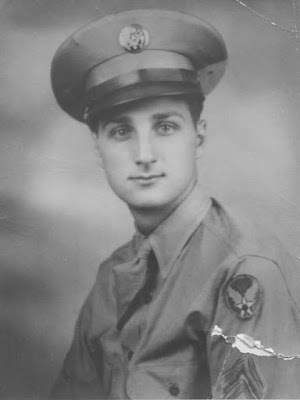 So I was surprised to learn that Uncle Army, born Amelio Sarracino, enlisted in the army in 1943 at the age of 38. He was a married man with a gorgeous young wife, but he may have had a bit of wanderlust. Due to his age, Uncle Army (that nickname is so ironic now) didn't fight for the military. He took photographs during his two-year stint. None of my living relatives knows where Uncle Army was deployed or what he saw and photographed. I found a book about the Signal Corps called "Getting the Message Through—A Branch History of the U.S. Army Signal Corps," by Rebecca Robbins Raines. After the attack on Pearl Harbor, the Chief Signal Officer felt he needed "a variety of specialized companies to meet the needs of radio intelligence, operations, photographic duties, repair, depot storage, construction, and so forth." I hope someday to find evidence of my uncle's World War II photography. Meanwhile, Uncle Army will always be the standard by which all other photographers are judged. This story didn't give you any concrete family tree tips, but maybe you'll feel inspired. 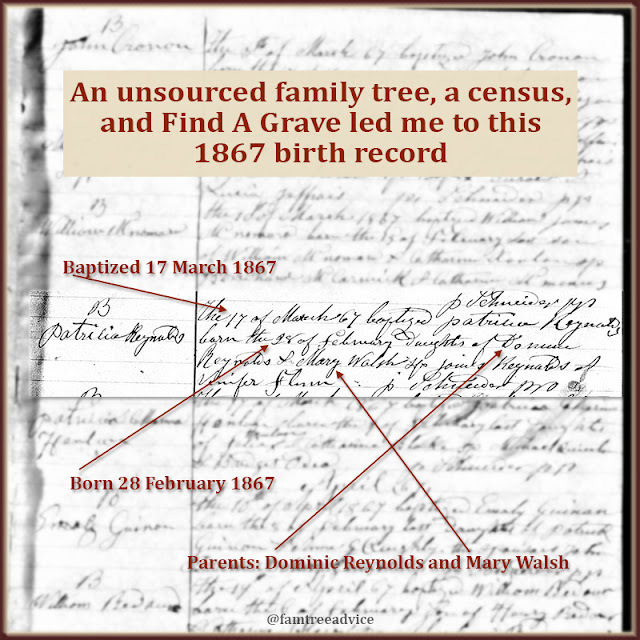 My inspiration was a genealogist's tweet about the stories our family photos can tell us. Go take a look at your family photos. I never met my Uncle Johnny—my mother's brother. He was a Staff Sergeant, a tail gunner, shot down in battle during World War II. Growing up we heard nothing more than that Uncle Johnny's plane crashed into a mountain, maybe in Yugoslavia. Then a few years ago my first cousin found an astonishing video on You Tube. The son of one of my Uncle Johnny's crew mates went to the town of Hum, Croatia. There he interviewed an old man named Nikola Tomic who witnessed my uncle's crash in 1944. Nikola was a boy on July 7, 1944. Nikola describes what he saw at the site of the crash of the B-17G Bomber shot down by Nazis. The bomber crashed about 1 kilometer from his farm near the border of Hungary and what is now Bosnia and Herzegovina. Knowing this date of July 7, 1944, it didn't take long to realize Uncle Johnny's mission—flying out of the same Italian airbase used by the legendary Tuskegee Airmen—was part of that summer's Battle of Normandy. The battle famously began with D-Day on June 6. 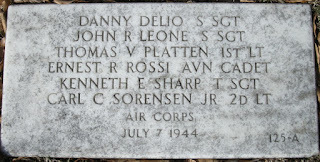 Johnny's plane was headed north to their bombing site in Austria when they were hit. My mother, a young girl at the time, remembers being told that five men parachuted out and five went down with the plane. She said none of them were ever found.